Need a DJ for your private party, wedding, fashion show, corprate event, yacht party etc? Need it to be purely based around funk, soul, jazz, and latin music? Then that is exactly what we can provide you with. 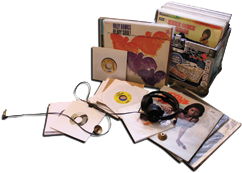 We can also provide bands if required through our fantastic personal links with many of the best independent labels specializing in jazz/funk/soul in the country. We are based in Devon and Cornwall but are happy to travel anywhere in the country or abroad if you need the FUNK!. On the technical side, we can supply whatever is needed from small PAs right through to large rigs with staging, lights and sound engineers. We can also provide quirky stage sets through our partners. We carry full public liability insurance and certificated PAT tested equipment. Please get in touch on the right if you'd like to discuss music for your event. being a bit of a hero n'all! Great party too. Some nice things people have said about our music and how it added to their wedding, birthday bash or straight up party! Drop us a line if we can do the same for you. Our wedding was two years in the planning, our planning started with a venue, the second thing was the DJ, our absolute first pick was Pete! We have been a huge fan during our time at Plymouth uni, and had one of our first dates at a Jelly Jazz night. After two years of waiting we couldn’t have been happier! The music was amazing, everyone, from the youngest to the eldest in our part was up dancing. We couldn’t have asked for a better accompaniment to our day. The best bit was how stress free Pete made the whole thing. He turned up, plugged in and played till it was time for drinks. Absolutely worth every penny and then some. Highly recommend! Pete played his fantastic sounds at my 50th and helped to prove that many of us can still dance the night away- no choice really!A fantastic night, fabulous beats, and many , many happy and exhausted friends ! Thank you Pete! We wanted to have a wedding night party where all our guests young and old danced and had fun to good music, Pete definitely delivered! Our dance floor was packed and we have had so many comments about how good the music was. In the run up to the day Pete was really helpful and everything combined helped to make our day special. If you want good music, great Dj and a good wedding party you need Jelly Jazz. P ete was the the first and only choice for playing at my 40th birthday, I've been dancing to Jelly Jazz since 1994 and it's always a good night but he excelled my best expectations with his set at my party. My friends and family (of all ages) are still recovering from strained muscles. Not only is his music the best eclectic joyous beats to behold, at the same time he's also a wonderfully calm and easy-going geezer. We had the best night of our lives and you played a massive part in that. The music was perfect all night and I lost count of the number of people who said it was the best set they had ever heard at a wedding. Apparently even my Granny (classical violinist aged 84) was busting some moves at one point- a feat never witnessed by my family and a great memory! The last few tracks with all our friends on the dancefloor was the most amazing end to the night and probably Lizzy's highlight of the day! Well what can we say! I've been lucky enough to DJ with Pete and his fabulous Jelly Jazz nights for a few years now (and what a privilege) and we couldn't think of anyone better to play at our wedding. June 21st.. what a party! The dance floor was bustling from the first drop of Pete's needle! The shapes being thrown inside and out of the hot barn were sometimes terrifying and sometimes epic! Pete read the floor as he always does and never let up especially those latin beats, plus he does scrub up well in his suit! Thank you so much much once again. 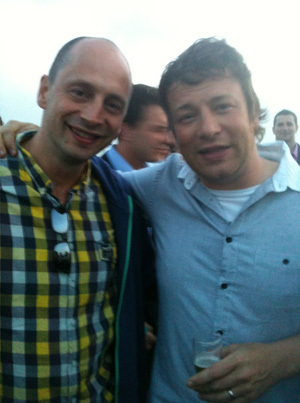 "Having been to many Jelly Jazz events I could think of no other DJ to play for our band's birthday party. Pete, you absolutely rocked it! The feedback from our band has been incredible. It was just a pity we couldn't continue for longer! Damn licensing laws making the venue close! Thanks again for helping to make it an awesome night." "Most importantly, we need to say a huge THANK YOU to you for playing the most amazing tunes at our wedding!!! We had so much feedback from so many people saying how much they loved it and that it was the best music they'd ever heard at a wedding. Those latin beats you threw out there were unreal. Friends and family on both sides, regardless of age and taste enjoyed themselves. So thank you, also, for bringing people together and being a part of the best day of our lives"
"Lucas and I wanted to thank you so much for playing at our wedding! The music was amazing, and everyone had the best time!! Lucas' family from Colombia loved it. It was perfect! It was very cool of you to agree to come and play and it's going to be a big part of our memories of an incredible day"
Your music won everyone over and it wasn't long before everyone was on the dance floor. My friends who have never experienced Jelly Jazz before thoroughly enjoyed themselves, so a big thank you to Pete, I had a fabulous fun time dancing, and blisters to prove it! So a really memorable evening for me, due to the music which brought us all together. Anyone thinking about hiring Pete, just go for it, you won't regret it. "Jelly Jazz played an absolutely storming set at our wedding! Pete listened to what we wanted before the big day; and then crafted it all together into an amazing set. We will never forget having Jelly Jazz for our wedding, and neither will any of our friends! Absolutely awesome, and worth every penny!" "Sorry this has taken a ridiculously long time but I was listening to some tunes today which reminded me of the fantastic fun we had at our wedding. I also realised I hadn't written to thank you for the exceptional job you did that night. It was perfectly measured, much commented on and got my wife's gran bogling to jungle, which can only be described as an extraordinary acheivement"
"Just wanted to say a big thank you for such an awesome night! everyone thoroughly enjoyed themselves as I'm sure you could see and me and Nick definately did!" 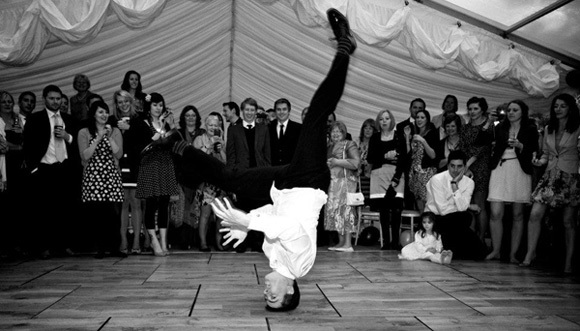 Mike Jeffries proving himself to be one of the SWs best breakdancers at his wedding party! Even after a few glasses of champagne and lots of cake! "You totally rocked it at our wedding! Considering all the years we've been going to Jelly Jazz and all the good memeories we have of your DJing - you were the obvious choice for our big day. Catherine and I, and a good proportion of our guests are fully signed up "funk heads" - so naturally we loved it - but your selections got everyone going funk-lovers or otherwise! It was great to see all our family, friends of all ages enjoying themselves so much and we wouldn't have done it any other way!" "...and thankyou for another excellent set and cross section of tunes. Loved the d&b! We partied on round the firepit until 3am, then without the kids had a great sleep until 9am in the tent there. Music has always been a cornerstone for Lisa & I and it was so worth pushing the boat out for our respective parties. There are lots of parties in Cornwall amongst our crowd and over the years, often with me as the sole DJ (! ), but it set a standard to have Jelly Jazz at ours, we're proud to have had you"
"You were brilliant - the d&b was perfect!! Thank you so so much"
"In the beginning of 2011 year, we received a call from Heineken Jazzaldia (International Jazz Festival from Donostia - San Sebastián, North of Spain), who gave us the opportunity to start organizing DJ sets at a new scenario of Jazzaldia Festival, called Nauticool. We were very happy and excited, cause this way we had choice to bring to our city some of our favorite DJs. Of course Pete Isaac from Jelly Jazz was on the top of our wish list. So on Summer of 2011 year, we made it real. Pete came to San Sebastián and after eat delightful tapas & drink some wines, he offered us some amazing and magical DJ sets on Nauticool scenario, located in an spectacular place over the harbor and beautiful view of the Concha Bay behind." Fabulous Music - good fun and good party vibes from everyone there - hotel staff and guests alike! Definitely recommend Jelly Jazz to anyone who wants a great party!